Lee: Manor House Gardens- Plant Appeal! The Friends Of Manor House Gardens are planning another planting day in Manor House Gardens. It is reliant on volunteers and donated plants. Here are the plants that are required- would you be able to donate a plant or two?! If you have some spares knocking about, then please email [email protected] or call her on 020 8318 9023. Plants to be 'potted up and named please.' Arrangements for collection can be made directly. Happy New Year! There will be a session at the Community Garden on Sunday 12 January 2014 from 10.30 am onwards. The beds are now prepared for the winter, and so we can spend a bit of time putting the garden in good order after the recent stormy weather - there is still quite a bit of detritus laying around and we need to check for any more damage to the fence panels which we repaired just before Christmas. Gardening in the sun (it’s forecast for Sunday)! 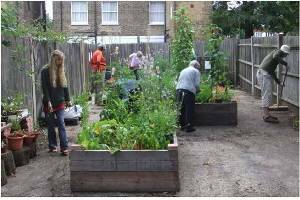 Please come along to the community gardening session on Sunday (14th) at 10:30am - noon at the Lee Manor community garden. We’ll plant seed potatoes and sow vegetable seeds into the raised beds. Please do bring along any spare veggie seeds that you have that you’d like to sow in the garden. Then, on Sunday 5th May, it’s the garden group AGM in the community garden at 10:30am (followed by gardening at around 11am). Please think about whether you’d like to join the committee for a year as we’ll need some new members. Karen is standing down as chair after two years in the role so we’ll vote for the new chair at the AGM. Please contact any member of the committee if you’d like to have a chat about being on committee (it’s very informal and rewarding) or let us know your interest via email: [email protected] The current members are Karen, Charlie, Ralph, Dan, Clare and Andrea. The little park between Lee and Hither Green has an active user group and they are having their Annual General Meeting soon. All users of the park are welcome- families, dog walkers, joggers and local residents. Location: The Community room behind the Park Cafe. Lee: The Good Shepherd Church, Handen Road to create new garden of contemplation. This afternoon I met with Iain Khan Gilchrist, community worker and stalwart of The Good Shepherd in Lee. He showed me around the site of what will hopefully become a new community garden! The Parish Church Council (PCC) are looking to develop land to the rear of the church building, turning it into a cotemplative space for use by the congregation and Lee residents looking for a quiet space for their thoughts. Practicalities: The long, slightly narrow space is paved and has a single entrance. It has terrific potential for veritcal growing. The space has a seven foot fence on one side and the red brick of the main church on the other. Ideas floated today include: private seating areas, arbours and pergolas to provide height and privacy. Plus planters and sturdy trellis to divide up the space. The long garden ends in a very quiet space; enclosed on three sides- it has the feel of a cloister about it. The new path will guide visitors slowly through the garden, allowing the garden to gently reveal its secret spaces. We will use jasmines, lavenders and other fragrant and evocative plants to frame the new garden. Fragrant climbers will also frame the entrance to the prayer garden in the corner. There will be additional seating here; the intention is it should form the heart of the prayer garden/ comteplation space. If you have ideas for this new garden and would like to get involved. Please drop me a line at [email protected]- Im keen to put together a small team to drive this project forward. We need ideas for design and for funding!